Happy Halloween! I’m not going to trick you: today’s food holiday is a real treat. October 31 is National Caramel Apple Day! Once upon a time, people handed out homemade caramel apples to trick-or-treaters who came to their doorsteps, but the fear of candy tampering put an end to this. That’s a real shame, because personally I’d much rather have a caramel apple than a lame Tootsie Roll, but that’s just me. Caramel apples were invented in the 1950s by Dan Walker, a sales representative for Kraft Foods. Individually-wrapped caramels were one of Kraft’s top-selling candies, and Walker’s creation led to increased sales (and probably made apple growers pretty happy, too). Recipes for caramel apples were printed on the labels, and still appear to this day. Vito Raimondi invented and patented a caramel apple making machine in 1960, speeding up the manufacturing process. Most people are content to make their own nowadays. 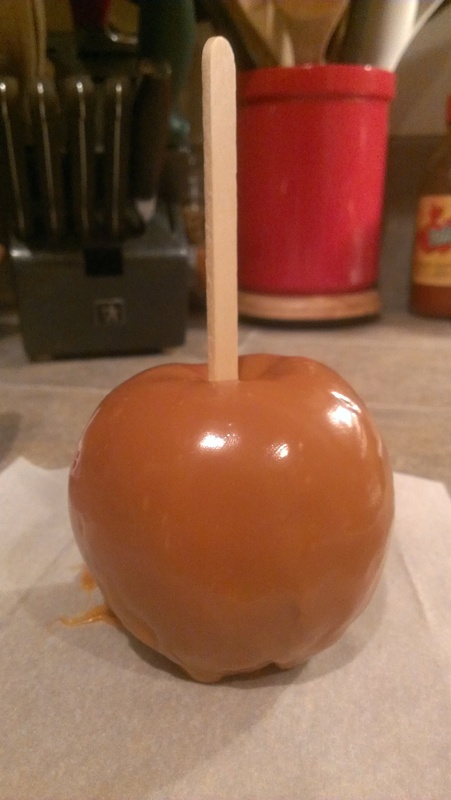 I hadn’t had a caramel apple in years. A couple of weeks ago we went to Hood River, Oregon to buy fresh apples along the “Fruit Loop.” We had some tart, crispy Crimson Crisps left over, so we made caramel apples from scratch. (Well, using a packaged caramel apple kit, but close enough). The contrast between sweet and tart, soft and crisp was wonderful! Hope you had a spooktacular Halloween!